You'll probably have either a hollow plasterboard wall or a brick / concrete wall. 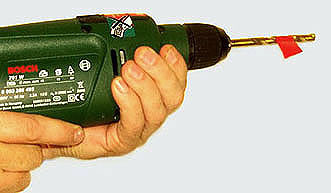 It is crucial you use the correct plug AND screw size AND drill size. Your packet of wall plugs should tell you all this. Tip If you don't have a drill with a depth guide on it simply use a piece of tape wrapped round the drill bit to show how deep you need to go! Tip Now this one really seems to impress people! When drilling into walls (especially brick) a lot of dust will come out and make a mess. Fold a large post-it note in to a V-shape and stick it directly under where you're going to drill. The dust falls into the post-it. Great! !